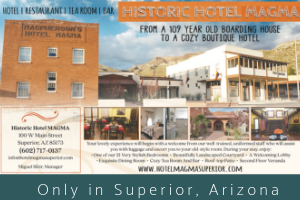 Author Donna Anderson is a former newspaper woman with a naturally curious mind, making her the perfect person to pull together an ambitious book on Globe, Arizona for the city’s centennial celebration in 2008. 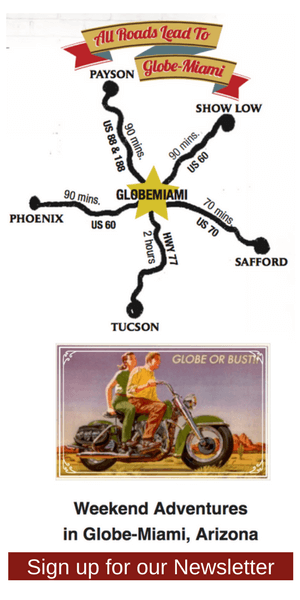 The book A History of Globe, Arizona covers the first hundred-plus years of the city’s history, from when silver was first discovered to recent times. Part one of the book covers many events marking Globe’s history, and offers some of the best historic photos we have seen in any book covering the area. Anderson pulled from a variety of sources, and received many contributions from the archives of local residents like Bob Zache, who’s photo of Will Rogers arriving at the Midland City Airport to attend the Coolidge Dam dedication in March 1930 is priceless. Part two is a who’s who of the families who helped found Globe. It is a fascinating peek into the world’s of families who made Globe what it is today, and many of the family names in the book will be recognizable to anyone who lives here. This is a must-have book if you are interested in Globe, or plan on living here. The book is available through the Gila County Historical Museum. Previous Top Ten Animated Films. What’s Your Favorite?